And lo, it came to pass, as my 41st birthday came and went, I found myself increasingly carrying papers to read them in bright window light. At the end of a long day at the computer, words started to swim. The final humiliation was when a nice young man came to the door to sign me up for a local wildlife charity, and I had to ask him to read the bank’s address from my cheque book. 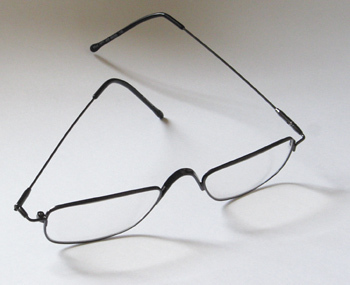 On my forty-first-and-a-half, almost to the day, I succumbed and ordered my first reading spectacles. Everyone tells me that they are not at all strong: +1/+1.5. But I’m shocked and amazed at the icy sharpness that has come into my life. I’ve been driving with an empty wash-bottle, the windscreen splattered with the debris of 41 and a half years of Kamikaze insects, and a youth in a parka has stepped out at the lights with a squeegee and soapy water. Actually, my saviour wasn’t a youth in a parka, it was a bottle-blond in a crisp white tunic, of which there are now four at the opticians. They seem to think that suits the aesthetic. Duncan is no more to be seen. Perhaps they told him he would no longer be welcome once he reached 51 and a half.